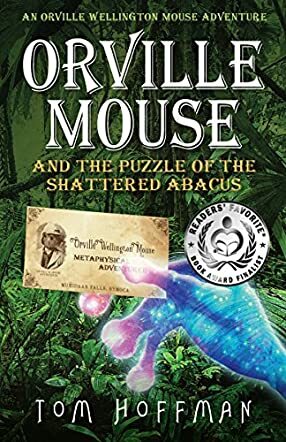 Orville Mouse and the Puzzle of the Shattered Abacus: Orville Wellington Mouse, Book 2 is a young adult metaphysical adventure fantasy written by Tom Hoffman. Orville's dream seemed so real. He was deep in the Symocan jungle, trying to enjoy the warm sun and luxuriant foliage, but Sophia seemed obsessed with counting the minutes and even seconds until something or other would happen. He just didn't understand why she was unable to dissociate for a while and relax, but, finally, he gave in to her prodding and challenged her to a race to the top of the volcano. He felt awful gazing into that bubbling liquid heat, the hot air all distorted and wavy as he peered into the volcano. And Sophia was actually determined that they should leave their precarious, yet relatively safe, perch on the rim, and jump into that fiery maelstrom. Sophia reminded him that it was only a dream, and she assured him that it wouldn't hurt, but it took the staunchest adventurer's leap of faith to allow him to clutch Sophia's paw and jump. Waking, Orville was relieved to see that it was, indeed, a dream, but was puzzled by the thick coating of snow that covered his night table. The chilly mess seemed particularly odd considering the jungles and volcano he had just experienced. There had to be a reason, he figured, for these two disparate, yet obviously connected, events. He'd have to discuss it with Sophia. Tom Hoffman's metaphysical adventure fantasy for young adults, Orville Mouse and the Puzzle of the Shattered Abacus, follows now veteran adventurers Orville and Sophie as they take on their newest assignment as a Metaphysical Adventuring team. Yes, it's the second book in Hoffman's series, and, yes, again, you can read this book on its own, but don't. Seriously. Each of Tom Hoffman's books is a gem, and they fit together to make an astonishingly good literary tapestry of metaphysical adventure, fantasy, science fiction and just a bit of quantum physics. Well, maybe a little more than just a bit, but don't let your lack of mastery of such matters keep you from diving head first, or jumping feet first as Sophie and Orville do, into Hoffman's quirky and most marvelous universe. Orville Mouse and the Puzzle of the Shattered Abacus lets the reader travel to distant planets, solve mysteries, and study the remnants of long-gone civilizations, and you'll be doing it in the finest of companies. I love seeing how well Orville and Sophia's strengths complement each other. Their banter and laughingly begrudging appreciation of each other's growing gifts is a treat, as is the way each keeps the other from taking themselves too seriously. Watching as the daredevil in Sophia is constantly tugging along the not so sure Orville has to be one of my favorite humorous aspects of this series. Proto, the Rabbiton and the newest addition to Orville’s family, with his love of adventure and rather odd appetite for encountering strange and horrible beasties, is a hoot and a half, especially when one considers his other avocation for baking little frosted cakes while wearing Orville's mom's aprons. Hoffman's fictional universe, which seemed so limitless in the Bartholomew the Adventurer Series, just keeps on expanding. Each new volume promises metaphysical delights, strange horizons, wormholes and hidden doors into far-off places, and ever more opportunities to learn, grow and experience alongside the adventurers. I'm so pleased with this book -- the characters are first-rate and the plot is marvelous. Orville Mouse and the Puzzle of the Shattered Abacus: Orville Wellington Mouse, Book 2 is most highly recommended. If you are going to write a young person’s book, a book to entice and enthrall the thoroughly committed imagination of an intelligent child old enough to sense the inauthentic and insincere efforts of a “gasp!” adult, a book by which perhaps another less maturely quick sanded adult might recall and re-immerse himself in that incredible realm of realistic make-believe that feels like a secret land once and regretfully abandoned, then you could do no better than to be Tom Hoffman writing his book: Orville Mouse and the Puzzle of the Shattered Abacus. In earlier times, it was Hugh Lofting and Beatrix Potter who possessed such writing gifts. Today, Mr. Hoffman may rightfully declare himself a master magician author. Orville Wellington Mouse (whose appearance in an earlier book I had the misfortune to have missed) is an instantly endearing character with an equally endearing girlfriend, Sophia, and a host of other endearing friends. Together, Orville and Sophia and something very unique called a Rabitton – whose name is Proto (also known as The Great Silver Rabbit) – embark on a series of adventures to solve a metaphysical puzzle. Referring to themselves naturally as metaphysical adventurers, these humorous creations of a highly creative mind inhabit and venture through a world at once reminiscent of our own and yet mind-blowingly tweaked from the everyday norm. It might also do well here to note that the puzzle they must solve is how to stop someone or something from ending Time itself: a huge task for some small folks. Tom Hoffman manages to infuse his marvelous book, Orville Mouse and the Puzzle of the Shattered Abacus, with an accelerating plot nurtured by grin-inducing humor, heart-warming friendships, and the mundane acceptance of the most terrific magic one might imagine – and he does so without once missing that perfect beat necessary to keep the perfect reading child totally enthralled. Orville Wellington Mouse wakes up from a nightmare, not realizing that it is just a hint of things to come. Orville Mouse and the Puzzle of the Shattered Abacus by Tom Hoffman follows the incredible adventures of Orville, his friend, Sophia, and his android friend, Proto, as they track down the origins of an amazing blue marble given to Orville by his dad. There is a strange connection between the marble and a beautiful necklace Orville buys for his mum’s birthday, so Orville and Sophia take their questions to Master Marloh, proprietor of the Book Emporium and head of the Metaphysical Adventurers. Since Master Marloh can’t identify this strange phenomenon, he suggests a visit to the Mad Mouse of Muridaan, Myrus, for a vehicle to take the adventurers to the cave of Ollo the Rock Mouse for answers. This only leads to more questions and on to a village at the base of a volcano and even to other worlds. Each time Orville and Sophia learn something new, though, it just means a new question and another journey. Does this rare marble have anything to do with the disappearance of Orville’s dad or are there bigger issues to be uncovered? Highly imaginative and full of fantastic scientific concepts, Orville Mouse and the Puzzle of the Shattered Abacus is engaging and plenty of fun for Young Adult readers. The characters are easy to relate to, the action is exciting, and you want to keep turning the pages to see what kind of amazing situations come up next. It might be helpful to read Orville Mouse and the Puzzle of the Clockwork Glowbirds first – I am sure it would also be a great adventure! All in all, a great book with plenty of opportunity for more to follow! In the second book of the delightful Orville Wellington Mouse series by author Tom Hoffman, Orville Mouse and the Puzzle of the Shattered Abacus is a book that many will enjoy from the very start all the way through to the end. The story of the adventurous young Orville Wellington Mouse continues, this time as he innocently sets off a chain of almost earth changing events when he simply buys his mother a beautiful necklace from an antique store. What he doesn't realize is that this is no ordinary necklace, and its powers seem to be able to alter the very laws of physics! Their discovery of the powers of the necklace lead them, as well as their friends, on an epic adventure to the dangerous land of Varmoran, all to try to find out the truth and stop a chain reaction that could imperil all! I so enjoyed Orville Mouse and the Puzzle of the Shattered Abacus. Author Tom Hoffman has done it again in this second installment in the Orville Wellington Mouse series. He has provided a book that both educates and entertains, one geared at children but enjoyable to adults, and one that will keep readers intrigued from the start to the end. Any young adult reader who enjoys a thrilling, adventurous and fun read, one that is creative and unique and will provide a level of educational information as well, should absolutely read this book and series. I highly recommend this book, and I look forward to reading more from author Tom Hoffman in the very near future! Orville Mouse and the Puzzle of the Shattered Abacus, the second book in the Orville Wellington Mouse series by author Tom Hoffman, is a fun story that engaged this reader from the start. Follow the exploits of lead character Orville and his friends, Sophia Mouse and Proto the Rabbiton, as well as an engaging cast of characters: Master Marloh of the Metaphysical Adventurers, the Mad Mouse of Muridaan, Ollo the Rock Mouse, Myrmac the Brave, the King of Ants, the Shrieking Terror of Tatuid, and Captain Patcher of the Dragonfly Squadron as they struggle to figure out the mysterious power that seems to be held inside a necklace that Orville has purchased for his mum's birthday, a power that seems to have the ability to control the physical world. Will they solve this puzzle in time, or will the very existence of the world be forever altered? Orville Mouse and the Puzzle of the Shattered Abacus is very easy to recommend. Author Tom Hoffman writes with a real understanding of the young readers he is trying to engage, and his work will make parents happy as well, especially with his skill in weaving in educational material with his fun and adventurous story lines. This book is suggested for any young readers who enjoy action, adventure, thrills, mysteries, or just fun reads in general, or for parents who want to find a good series that will encourage their children to read. I look forward to reading more of this promising series from author Tom Hoffman, and I certainly hope that the author writes fast!